A zone file is a small set of instructions for resolving the specified Internet domain name to the appropriate number form of an Internet Protocol (IP) address. These instructions reside in a file on the server that administers the site. This article explains how to edit your zone file hosted on the (mt) Media Temple nameservers, NS1.MEDIATEMPLE.NET and NS2.MEDIATEMPLE.NET. It is also possible to edit your zone file here, in anticipation of an upcoming change, to using (mt) Media Temple's nameservers even if you don't currently use them for your domain. Check your current nameservers at Whois.net. Watch this video to learn how to add or edit your DNS records. 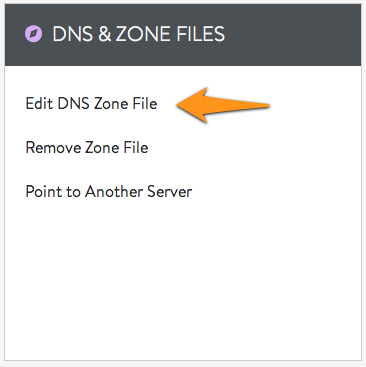 Any changes to your DNS zone file will need to propagate across the Internet. As a general rule, we recommend to allow 24-48 hours for DNS propagation. Read below on how to lower your TTL value for a smooth transition. Select the domain you want to edit from the DOMAINS tab. Click on Edit DNS Zone File. Make your desired changes - see below for details. When you're done, click Save. Select the domain you want to edit from the DOMAINS tab. Alternatively, select your WordPress service from the services list. Click on manage site. This is found by clicking on the preview box of the domain that you wish to edit. Click the manage button that's located to the right of the domain that you wish to edit. Follow the steps in the earlier section to access your zone file. Click directly in one of the text fields of an existing record to change it or to add a new record, click the + ADD ROW button. Enter your information for the new record. Name: Enter a subdomain of your domain or leave the box blank if you would like to edit your top-level domain. Example: store if you would like store.gs-example.com. Type: Choose one from the dropdown menu. A for an IP, CNAME for a domain, MX for mail. Data: Enter an IP address or domain name. Domain names must end with a period. MX records must also have a number before the domain, separated by a single space. 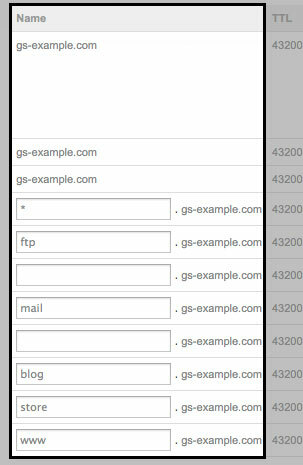 TXT records are often used for domain ownership verification and to create Sender Policy Frameworks (SPF) for email security. The character limit for TXT records is 255. In some instances, you may need to exceed this character limit for a single record. In order to do this, divide the string into blocks that do not exceed 255 characters and concatenate them using quotes. Below is a sample key for a DKIM TXT record that exceeds 255 character and instructions for adding it. Add both strings to the same data field of a TXT record. Do not include spaces between the strings. For detailed instructions on how to create an SRV record for your domain, please see: How do I create an SRV record? _autodiscover._tcp.example.com. 43200 IN SRV 0 5 80 webmail.example.com. 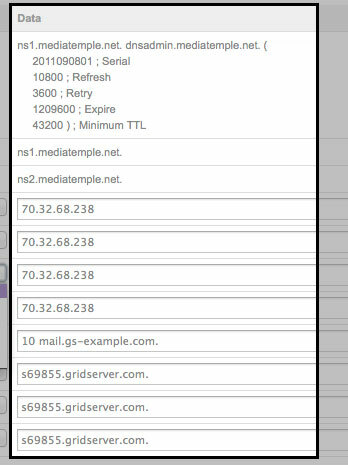 This will point your site and email to your (mt) Media Temple server - it's the standard DNS configuration with which your domain is added. Click REVERT ZONE and save. Need a smooth DNS transition? Lower your TTL. Before you make any other type of DNS change, it's a good idea to consider whether you will need to lower your TTL. For more information and detailed instructions, please see: How can I lower or raise the TTL for my domain?